Taking to Saint-Émilion’s cobbled lanes not long after sunrise, I felt as though I’d gone back in time a few decades, perhaps even a few hundred years. In the early-morning light, the graceful wrought-iron signs appeared in silhouetted form. Though the establishments’ names were in shadows, the contours of a sign’s grape leaf, baguette, or sausage hinted at what activity would soon be taking place inside those marchands de vins, boulangeries, and boucheries. On a main square, waiters dressed tables with linen cloths, and merchants set out pots of grapevine plants for sale. Another shop’s proprietor rolled out a weathered, caramel-colored barrel, carefully arranging bottles atop it for a shop display. Hordes of visitors had not yet descended upon the 8th-century city, and I felt a bit like a local, even though my camera undoubtedly gave me away. It was during this morning that I would first become acquainted with Saint-Émilion’s steep roads, known as tertres. There are four of them in the city, and as I found out on a subsequent evening following dinner, they make for a lively walk – especially after you’ve enjoyed a glass of the area’s esteemed wine! 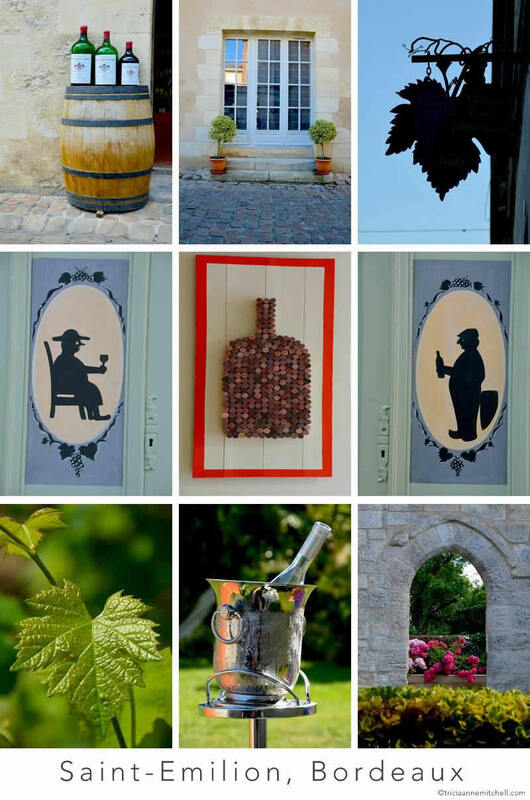 Enclosed by vineyards producing some of Bordeaux’s most esteemed wine, it’s no wonder that the village of Saint-Emilion is one of the region’s most alluring destinations. During a weekend there earlier this year, I found myself effortlessly charmed by Saint-Emilion’s graceful limestone buildings, its window-boxes brimming with beautiful blooms, its almond-flavored macarons, and elegant wine culture. By day, Shawn and I ascended the 196 steps of the village’s church-tower and explored its vineyards, and by night, we shared exemplary bottles of wine with Shawn’s parents. One night, a generous winemaker sitting at a table beside us even invited us to share a glass of one of this creations. What a way to welcome us! 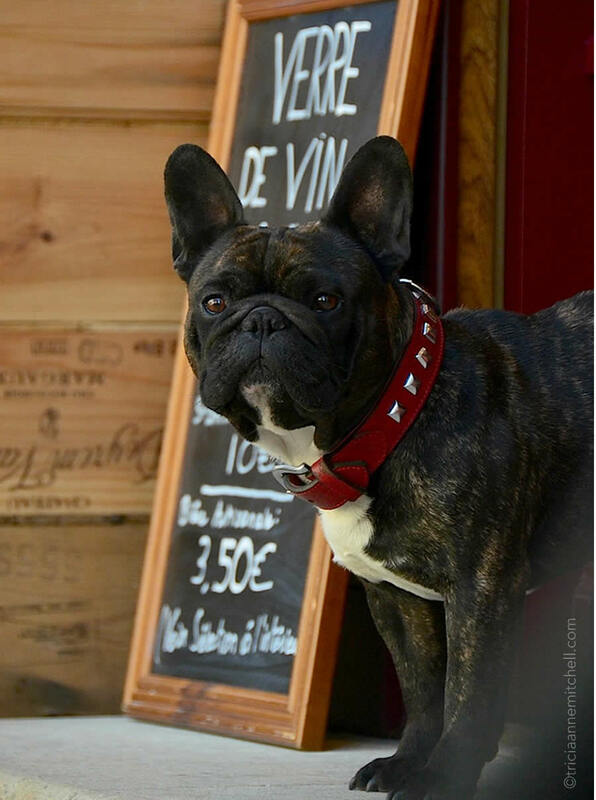 Georges, a regal French Bulldog, stands guard at a wine shop in the village of Saint-Emilion France, situated in Bourdeaux wine country. We recently met Georges, who spends his days sunbathing and greeting wine tasters at his master’s shop. A firetruck-red likeness of Georges also sits in the entry way, but laid-back Georges garners most of the attention of the passersby.